NEW YORK, Oct. 8, 2018 /PRNewswire/ -- Collier Creek Holdings (NYSE: CCH.U) (the "Company") announced today that its founders rang The New York Stock Exchange (the "NYSE") Closing Bell® on October 5, 2018, to celebrate the initial public offering of the Company's units on the NYSE. Collier Creek Holdings is a blank check company incorporated for the purpose of effecting a merger, share exchange, asset acquisition, share purchase, reorganization or similar business combination with one or more businesses. While the Company may pursue a business combination in any industry, the Company intends to focus its search for a business that would benefit from the founders' experience in the consumer goods industry and related sectors. The Company was founded by Chinh E. Chu, Roger K. Deromedi and Jason K. Giordano. Mr. Deromedi currently serves as Non-Executive Chairman of the Board of Directors of Pinnacle Foods, Inc., and is the former Chief Executive Officer of Kraft Foods, Inc. Mr. Chu is Senior Managing Director of CC Capital, a private investment firm he founded in 2016, where Mr. Giordano also serves as Senior Managing Director. The Company's founders rang the NYSE Closing Bell® on October 5, 2018, to recognize the listing of the Company's units and the end of the first day of trading. The Company's units consist of one Class A ordinary share and one-third of one redeemable warrant to purchase one Class A ordinary share at a price of $11.50 per share. 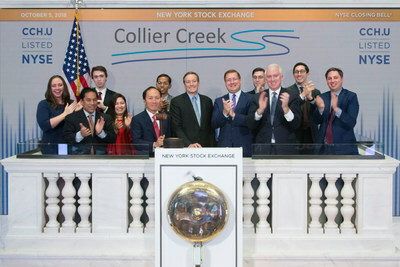 "We are proud to celebrate this important milestone for Collier Creek by ringing the Closing Bell® at the NYSE," Chinh E. Chu said. "We have brought together a talented and experienced management team as well as a terrific board to best position us to drive value for our shareholders." Roger K. Deromedi added, "As we explore opportunities in the consumer goods industry and related sectors, we believe our significant operating and investing experience, professional relationships and capital markets expertise can have a transformative impact for the right partner. We look forward to partnering with a target business to enhance its growth potential by improving performance and providing access to the public equity markets." "We believe there are numerous companies in the consumer goods sector that could benefit from our long-term strategic capital and proven operational support," Jason K. Giordano said. "We are excited to complete our initial public offering and begin the search for a business combination partner." This press release contains forward-looking statements within the meaning of the Private Securities Litigation Reform Act of 1995. Words such as "may," "will," "expect," "plan," "anticipate," "estimate," "intend" and similar expressions (as well as other words or expressions referencing future events, conditions or circumstances) are intended to identify forward-looking statements. Forward-looking statements in this press release are based on the Company's expectations and assumptions as of the date of this press release. Each of these forward-looking statements involves risks and uncertainties. Factors that may cause the Company's actual results to differ from those expressed or implied in the forward-looking statements in this press release are discussed the Company's filings with the U.S. Securities and Exchange Commission, including the "Risk Factors" sections contained therein. Except as required by law, the Company assumes no obligation to update any forward-looking statements contained herein to reflect any change in expectations, even as new information becomes available.